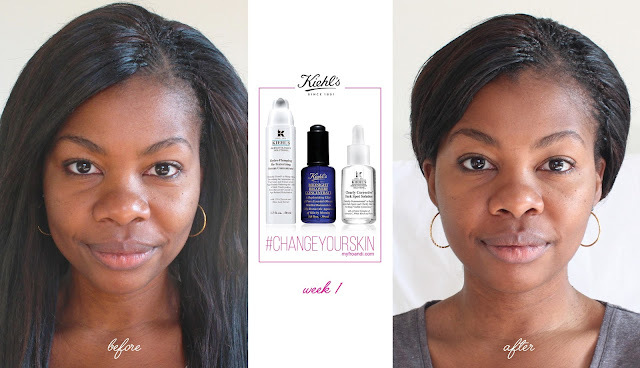 It’s been a week since I began Kiehl’s and BeautyBulletin’s 28 day #ChangeYourSkin challenge so I’m here to give you the first of my weekly updates. Kiehl’s boldly claims that they can change your skin in just 28 days using their super serums: Midnight Recovery Concentrate, Dermatologist Solutions Clearly Corrective Dark Sport Solution and Dermatologist Solutions Hydro-Plumping Re-Texturising Serum Concentrate. 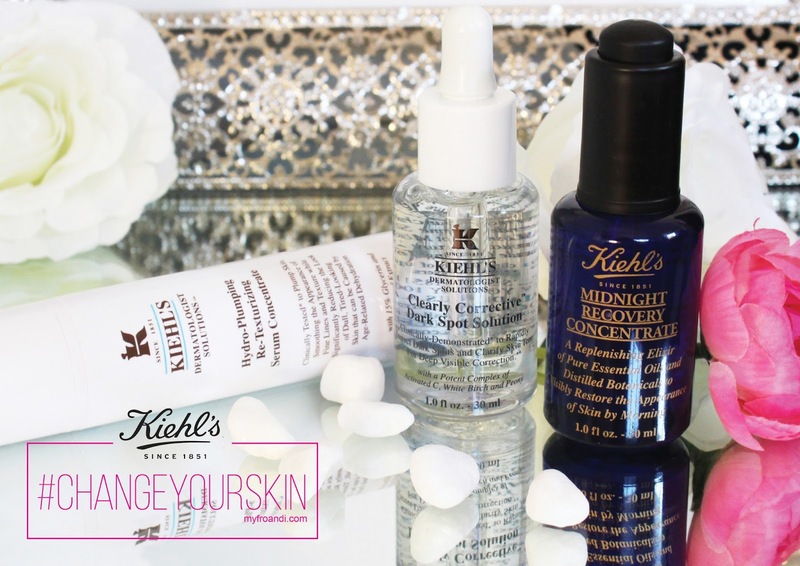 I’m not going to lie, when I first read the info about these serums, especially the Midnight Recovery Concentrate, I didn’t believe I’d notice a difference in as quick a time as they claimed. This serum claims to address tired and dull-looking skin by restoring moisture to dehydrated skin. For more details on this serum and its ingredients, click here. First impressions: A little goes a loooong way. Just one pump worth of product is enough for my face and neck. It has a very neutral scent which I like in my beauty products. Its texture is jelly-like and looks like it might be greasy but it glides on and is absorbed quickly by my skin. I begin my three step routine with this serum. This solution is formulated to address dark spots, discolouration and hyperpigmentation. For more details on this serum, click here. First impressions: It has a dropper applicator which combined with its strong scent scared me a bit. It smells quite potent! It felt like I was about to apply some hectic potion onto my skin. Well, my fears were squashed quickly when I applied the serum because the scent disappears as soon as it’s absorbed. Key areas I’m hoping to see a change in are my neck and lips. I think this will take longer than a week. This elixir promises to restore and repair your skin during the wee hours, leaving you with soft, hydrated and less tired looking skin in the morning. It has a bunch of essential oils that help to nurture and replenish your skin. For more details on this serum, click here. First impressions: I love the bottle. Just had to get that out the way. Like the Dark Spot Solution, this also has a dropper applicator. And again, a little goes a long way. 2 -3 drops like the box says is enough to cover my entire face with. After just two days, I started noticing a difference in my skin. I’ve been waking up with the softest skin I can remember. And even when I’m physically tired, or I’ve had a rough night, my face isn’t giving it away. It feels refreshed and ready to go. My face and lips are more hydrated, my only gripe at the moment is that my skin now gets shinier as the day goes on so I find myself blotting throughout the day, especially my nose. I’m looking forward to seeing a visible difference in my hyperpigmentation on my neck and lips. So far, I’m impressed! so glad ur reviewing these products. Have been wanting to try their stuff but the price tag just put me off. Your skin definitely looks fresher. I don't know if it's just me but I can see a visible difference hey, you skin looks brighter! I don't know if it looks different yet but it definitely feels different!